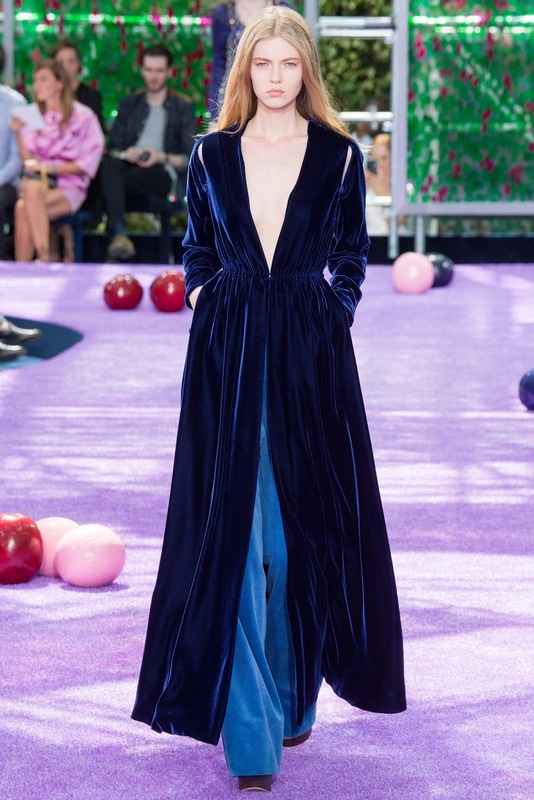 If a drastic step of changing the direction of a fashion house at the likes of Dior and offering a new concept of haute couture was not quite done simply with a collection of clothes that are very different from what is known to many people, creating a magnificent and charming set could be a brilliant method. 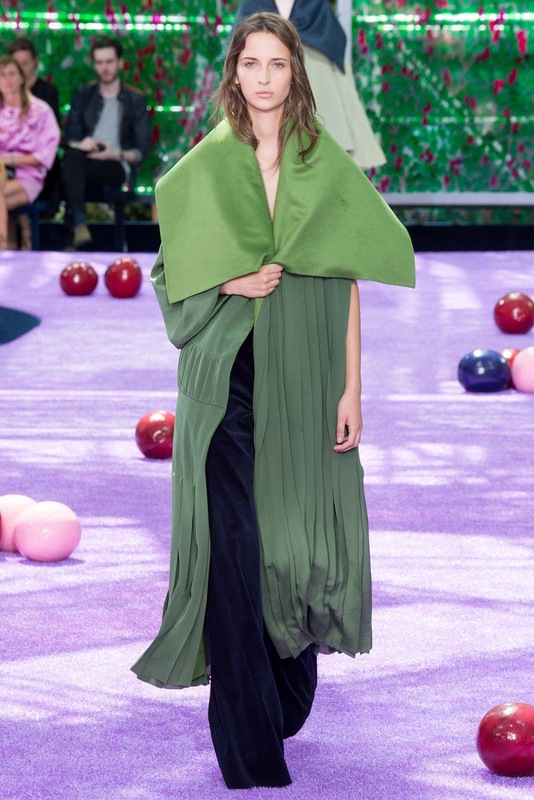 That was done by Raf Simons for Christian Dior Haute Couture Fall/Winter 2015/16 collection. A glass tent with huge panels were painted by hand with flowered mottifs, as little Christian Dior was surrounded by garden in his hildhood in Grenville, was established in the area of Musee Rodin, with purple carpet and scattered objects depicting Apples, the forbidden fruit that made Adam and Eve expelled from paradise. 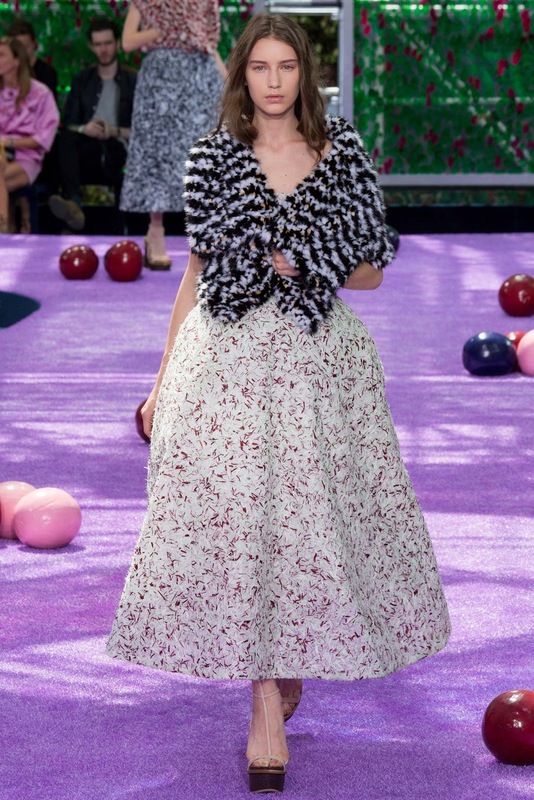 "The idea of ​​a purity and innocence versus luxury and decadence, and how the idea was capsuled by Dior garden idea - not a flower garden, but more sexual," as stated in the show notes, was the inspiration of this collection. 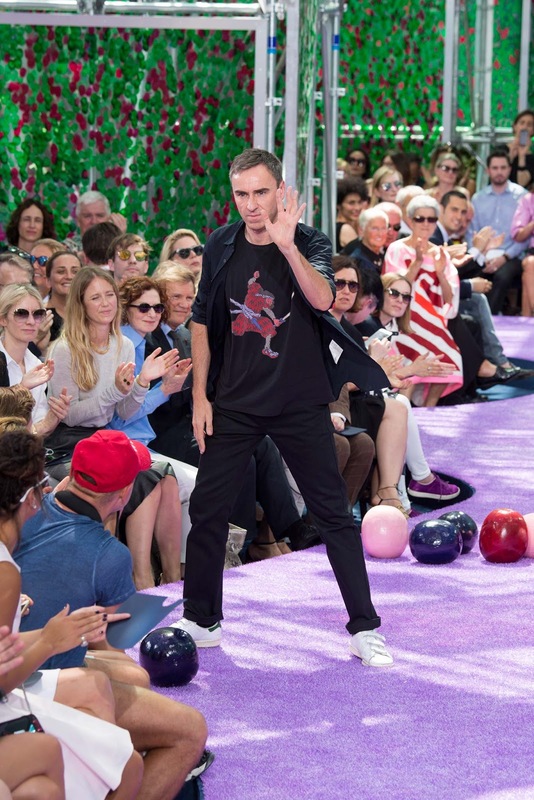 The important point was how Raf played outside the safety zone of DNA Dior. 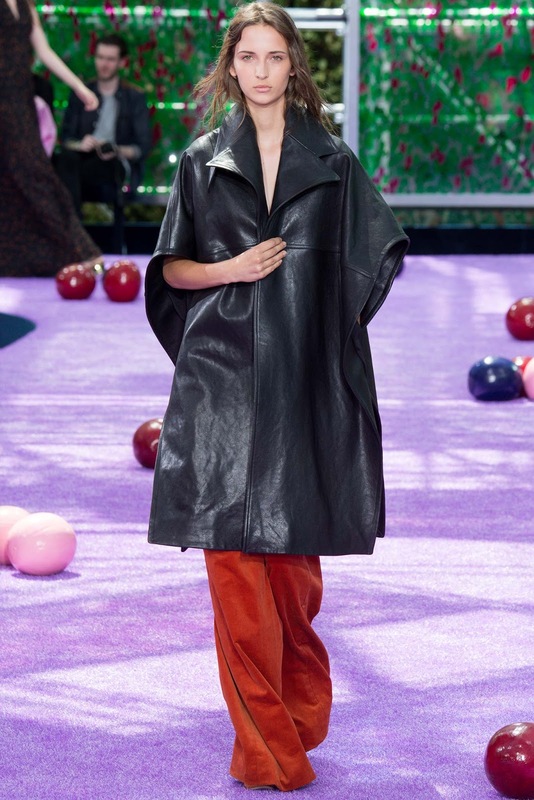 Coat made starting with a regular grid pattern which is then perforated and coupled with the arm, with the addition of fur, maing it it as versatile version of a cape and a coat asymmetric. The flower gardens were so crowded it was offset by a light dres made with folds or pieces of fur or an A-line dress with a pattern of leaves. In addition, dres with a slit along the right side and left open giving the impression of frivolity, though Raf is known as a designer who makes his clothes covering and simple. If likened to music, Dior collection is like Haydn, Symphony no. 22, "The Philosopher". 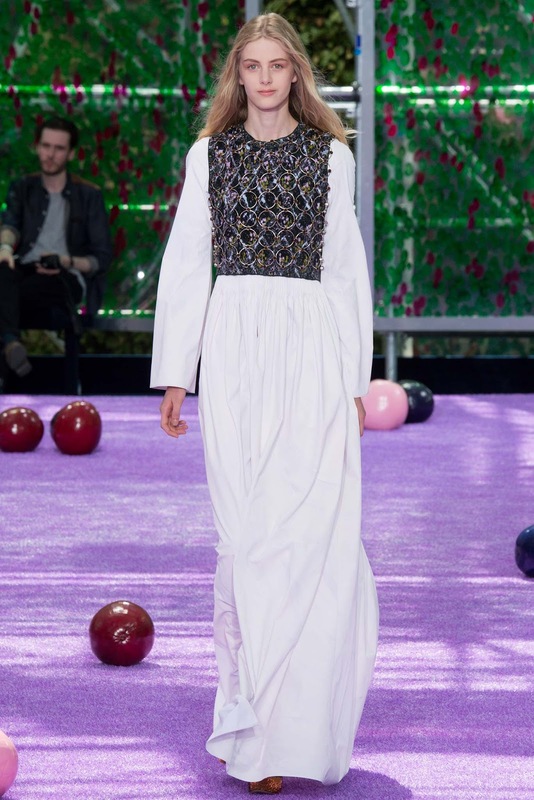 There is a quality to the "down to earth" design at Dior, who gave all pieces a humanist breath. Not many people think of it when a set is so complex but then is used to display a collection with an easy movement, for example a sequined dres with familiat cut and yet it gives no warning of beauty. But that's the new Dior, which is not afraid of confinement and will always break the rules while creating new modes, and as Dior's New Look post World War II, New Dior Couture will always raise a question mark, and for those who doubted his vision must wait, because the answer of these questions will only appear long after its heyday. And for you all haters, bye gurl! Signorfandi, new, fresh, looking forward!